Welcome to the Maple Syrup Producers Association of Connecticut (MSPAC). 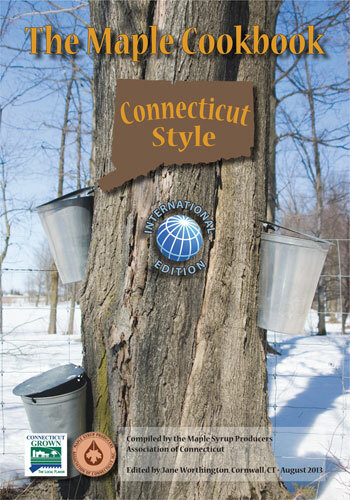 The traditional season to make maple syrup in Connecticut extends from early February until late March. This is called “the sugaring season”. Freezing nights and warm, sunny days are necessary for the maple tree to yield sap, a colorless liquid with a light, sweet taste (2%-4% sugar). Maple syrup producers, also referred to as sugarmakers, collect this maple sap, and through boiling, the maple taste and amber color are formed. We hope you enjoy reading more about MSPAC, syrup making and all things maple! Flander's Nature Center and Land Trust is located in Woodbury, Connecticut. In accordance to their mission to foster understanding and appreciation of nature, art and the wonders of the natural world through land preservation, stewardship and education, they operate a sugar house and tap trees all across town. The organization is a monument of conservation and volunteerism. Their sugar house is open to the public. If you sell syrup in CT, please click here for new regs. -Can maple syrup reduce inflammation?